Hurrying through an unpredicted rainstorm I was late for the first masterclass of the day. Well this was jazz, the music of the unpredictable, so it sort of fitted. The masterclass with New Yorkers Kris Davis and Tony Malaby began the one-day Sydney Con International Jazz Festival for 2018. There was talk of intervals in birdsong, and piano clusters, and saxophonist Malaby spoke of actively moving away from jazz forms. The two played a tantalising duet with Davis’ piano shimmering out Messaien-like clusters and chirps. The lovely wood-walled Recital Hall felt, in this hushed and rarified atmosphere, like church. Barney McAll mentioned the phrase “Music is church” during his masterclass, quoting his long-time employer, Gary Bartz. McAll was next up and his session was as freewheeling and live-wire as Davis/Malaby’s had been pensive and considered. 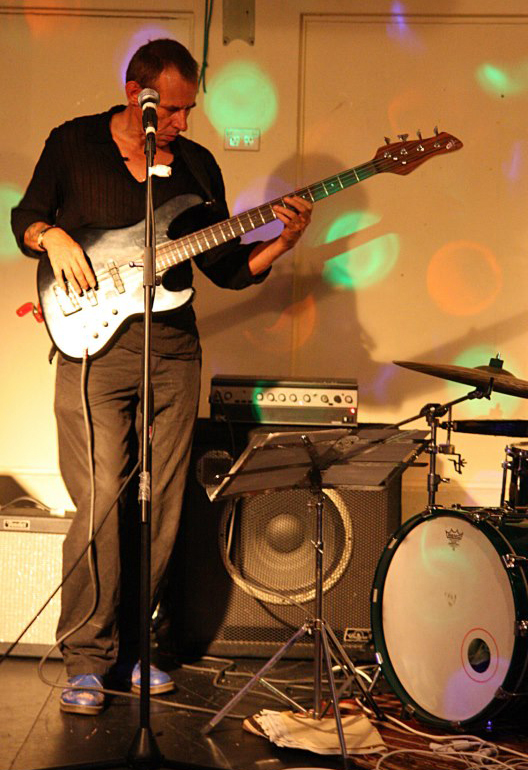 McAll is a unique Wayne Shorter-like figure in Australian jazz, original to the point of almost being his own genre, and intuitively Zen in his approach. He spoke of freedom, Skrillex and technology (giving an insight into the surprisingly mechanistic origins of his compositions). When he sat at the piano to demonstrate, his dynamic attack made me jump (as it always does). Later in the day I would enjoy McAll in his ASIO (Australian Symbiotic Improvisers Orbit) setting. 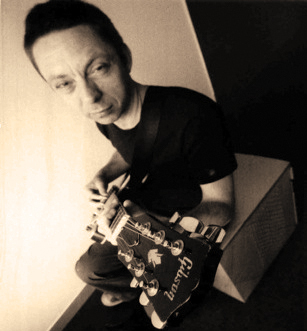 His band of drummer Hamish Stuart and bass mainstay Jon Zwartz, with “the children” (McAll’s affectionate term) – young guitarist Carl Morgan and Mike Rivett on tenor – took to all the quirky twists and turns in his compositions, which ranged from roiling gnashes of ensemble interplay to intensely beautiful skeins of arpeggio. Was McAll my highlight? In a day of highlights it was hard to say. Out of the cloisters and into the much more easy going Jazz Cafe where there was food and drink and people talking – and the rumbunctious Geoff Bull and his young band The Finer Cuts blasting traditional jazz. This music is always a delight – a ribald reminder of the street (and brothel) origins of what has evolved into high art. The triple horn weavings of Bull’s trumpet with tenor and trombone shouted out that joyous anarchy that is still at the heart of even the most contemporary jazz. Pianist Harry Sutherland had the style down in spades, with a rolling grin to his playing. ‘God bless Geoff Bull’ is all I can say. The Jazz Cafe also presented Darren Heinrich‘s Trio – the classic organ-guitar-drums sound that is one of jazz’s most sublime mutations. The Trio’s sound immediately transformed the Cafe’s club-like atmosphere, the air heavy with imagined nicotine. Guitarist Sam Rollings‘ biting blues-jazz tone was the perfect foil for Heinrich’s intense Hammond attack – at the top of their dynamic the Trio was verging on rock-band loud. For 2018, the Con Festival’s artistic director, David Theak, brought together a truly fascinating program – impressive not only for its quality, but for the breadth of its range. At the other end of the music’s timeline from the original street music represented here by Geoff Bull, we had the Berlin-based duo Spill. This was truly startling stuff. Both Magda Mayas on (extremely) prepared piano and Tony Buck on drums treated their instruments as boxes of possibilities, to be unpacked in real time, as they played. It was all the more remarkable, considering that both instruments are acoustic percussion instruments, traditionally incapable of a non-tremolo sustain. Well, I heard a piano sing like a bird and a bass drum moan like a wounded bull. The inventiveness of Mayas and Buck was jaw-dropping, but also transportingly beautiful. Back to the Jazz Cafe to bring myself back down to earth from the ionosphere. Andrew Scott‘s Pocket Trio were playing, and it was just what I needed. Scott has based his group on the driving but inventive trios of Oscar Peterson and Bill Charlap et al. They swing like hell but can turn on a dime. The other Pocketeers, bassist Max Alduca and drummer Tim Geldens seemed to relish the ride as much as Scott – whose driving and unfrilly playing reminded me more of Tommy Flanagan or even Ray Bryant than the sometimes frilly Peterson. (Scott’s droll spoken song intros are worth admission in themselves). Fortrified with a few glasses of good red I took in the experience of Stu Hunter‘s ‘Migration’ project. A massive work, performed by a percussion heavy ensemble, it really is something to see (and hear). Grooves are set up and move in and out of rhythmic lattices to reform into new grooves. The players he assembled worked the material beautifully in their solos, notably saxophonist/clarinetist Julien Wilson and Phil Slater on trumpet, with Tina Harrod‘s voice lending an ethereal Gospel edge to the atmosphere set up by Hunter’s astounding ensemble writing. David Theak had joked with me that if I stayed “dawn till dusk” he would shout me a cold one. By the time it came around for the last concert of the day – the international Festival star artist Gretchen Parlato – I was still fresh as a daisy, buoyed by the energy of all the superlative music I had witnessed. And her music made me feel as it I was floating on air. As all truly great jazz vocalists before here, Parlato’s voice was an instrument among instruments. The unique makeup of her ensemble – gut-string guitar, cello and percussion – surrounded her airy voice with an ebb-and-flow of an entirely organic nature as she moved thru bossa and Bach, and beyond. The effect was mesmerising. The Verbruggen Hall seemed at times too large for the intimacy Parlato and her group conjured – I would have loved to hear her in a closer, smaller space. But this is a small quibble, too small for so sublime an experience. So to the train home, high as a kite from such a day. Weaving through the swelling VIVID crowds coming into the sparkling city as I was going out, I knew it would take me a while to process it all. Finally, thanks to David and the Con for putting their resources behind such a landmark event. Jazz is a living, breathing music and it is gratifying to see audiences for such a program not only exist, but exist in enthusiastic numbers. I recently was transfixed while watching my dog running around and around the yard. He appeared to be running purely and simply for the joy of running; the joy of his muscles and his velocity and the ground rushing beneath him. Children also often tumble or jump or yell purely for the joy of the thing; as adults, this simple joy of the moment is gradually sullied and boxed in and all but eradicated. Artists have always seen the value of keeping that joy fresh and pure, jazz artists especially. 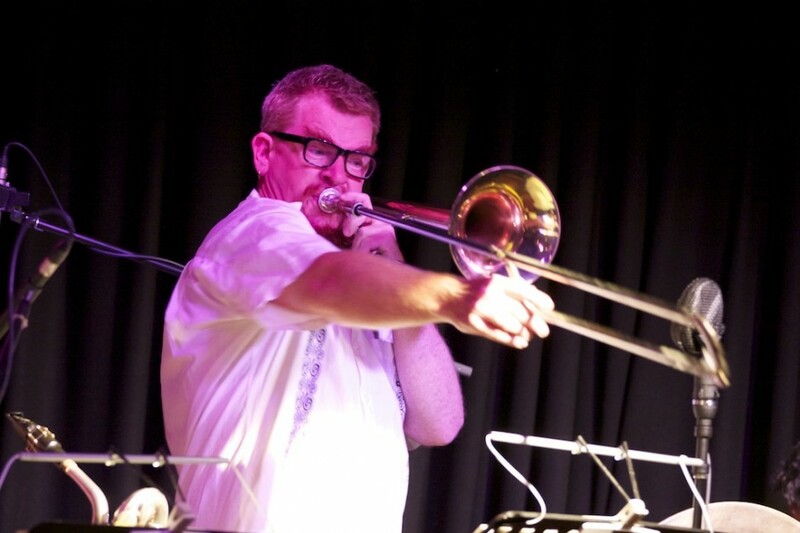 Trombonist James Greening has always been one of our most joyful and joyous players. 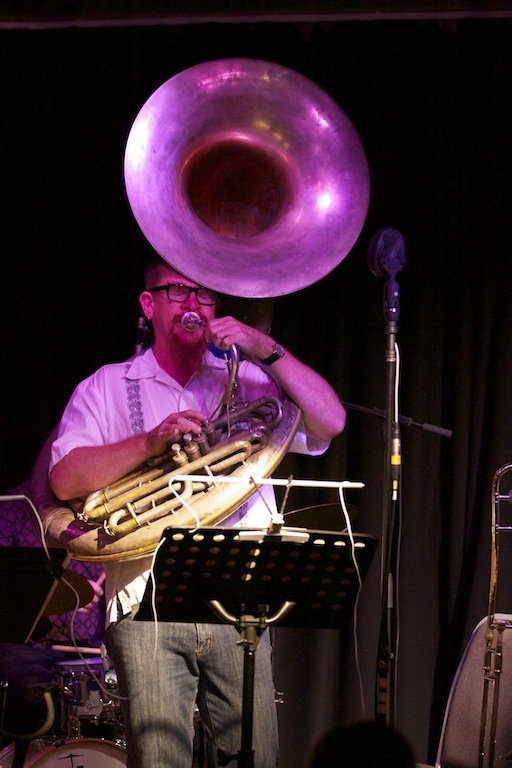 His very choice of instrument is joyful – the whinnying, hallelujah-ing of the trombone and the jovial flatulence of the sousaphone just bring a grin to your soul. 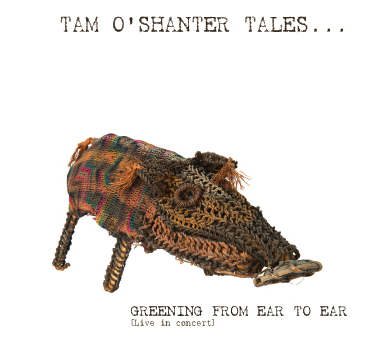 Greening’s latest project – with his super-septet, Greening From Ear to Ear (yes, a joyously silly what-the-hell pun…) – is Tam O’Shanter Tales. The compositions were inspired by a network of ideas centred around the natural beauty of Tasmania and the coastal community of Tam O’Shanter, but including the experience of Hazaran refugees settled in Tasmania, as well as thoughts of the hopes, fears and life-struggle shared by all humans. The six-track album was recorded last June at Sydney’s Sound Lounge, live in front of a buzzed-up audience – and I am so glad it was. The joy springs up immediately from opener ‘Parallel Lines’ ­– Brett Hirst’s bass harmonics grow into a Afro-Cuban groove driven by the drums and percussion of Hamish Stuart and Fabian Hevia. A bristling ensemble section opens out to a Greening solo – joyous of course­ – and Andrew Robson’s snaky alto. Next up is the happy NOLA march-blues, ‘Lumpy’ which has Greening blasting some rumbling sousaphone and Paul Cutlan abstracting the air with bass clarinet Dolphyisms. ‘I’m No Monk’ channels the joy that is Thelonious – pianist Gary Daley’s solo is aptly splay-fingered and righteous. ‘Hazara’ is the centrepiece of the album – spiritually and musically – as Greening gained inspiration during a period of ‘deadlock’ from the novel, The Kite Runner. The asymmetrical 17/8 groove is rendered surprisingly symmetrical by the band’s authority. The mood becomes one of a dance, a proud dance, a quiet celebration of the victory of living another day. Gary Daley’s accordion sounds like women’s voices, Cutlan’s bass clarinet like a sirocco. The accordian is also used, now in cluster-chords, to introduce the languid ballad ‘Sleeping Beauty’, which lulls us with watercolours of Tasmanian greens and olive-blacks and mist breathing off a river’s silver surface. Greening closes Tam O’Shanter Tales with the loping waltz-time blues ‘Early Morning’ the vibe of which suggest a wry eye on the world and hope for a new morning after darkest night. James Greening may be a joyous man but he is no clown ­– it is one of the noblest human attributes to know life and the world in all its cruelty and compromise and still remain positive and bright; it is a daily battle for anyone who thinks at all. In Phillip Johnston’s spoken intro to the recording, he says “Here we are firmly rooted in the present; one foot in the future and maybe an elbow in the past…”, echoing the kind of spiritually-centred mindfulness by which James Greening lives (and plays) and which informs the heart and deep soul of Tam O’Shanter Tales. Among the slew of bedroom Beyoncés and preteen chirrupers that grind through the X-Factor/Idol/Voice talent-quest mill it is nice to see the occasional hardworking muso get up. It is also nice when success in these nationally broadcast spectacles pushes the career of said hardworking muso into a better place. Sure, there is always the danger of being seen as ‘selling out’ (whatever that can still possibly mean today) or losing one’s hard-won street fan base, but it is a danger the artist’s popularity should over come. I was happy to see Wes Carr get up on Idol in 2008, and I was even happier to see Darren Percival take out runner up on this year’s The Voice. Percival has been a well respected and admired performer on the scene – always a knockout as the looping Mr Percival – for years. The story goes he had 18 dollars in the bank when he received the call-up from The Voice – now he tours nationally. And long may he run. His recent release, A Tribute To Ray Charles – apart from being a great listen – is a smart move. In one fell swoop, the choice of recreating, beautifully, fifteen tracks made famous by Brother Ray will simultaneously satisfy his new fans (his Voice persona was soul man supreme), not alienate his existing fans (anything to do with Ray Charles will be eternally cool) and move him into the next phase of his journey (tuxedo’d no-sweat big stage performer). Another smart thing about this choice is that it doesn’t take much for Percival to slip into Ray Charles’ musical skin. Neither man has a conventionally smooth voice, yet both exude a larger than life joyousness in delivery which can generate an excitement that whips the audience (and their bands) along – witness Percival’s take on Stevie Wonder’s ‘I Believe (When I Fall In Love)’ on the Voice finale, a brave choice of song which he turns into a vehicle for some gospel-sized intensity. Of course, gospel-sized intensity was always Ray Charles’ forte. After all, the man invented Soul music by secularising (and sexualising) the frenzied church music of the American South. He didn’t have to do too much to it either – the call-and-response, high stepping rhythms, melismatic vocal swoops and fevered abandon were already there. Despite going for a broader appeal, on A Tribute To Ray Charles Darren Percival keeps the wildness and ecstatic edge of the Charles’ originals intact. 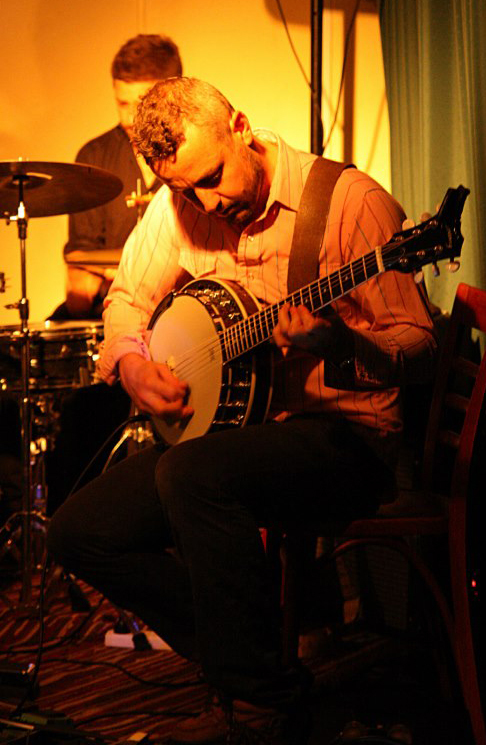 The band behind him bristles with Australia’s finest – James Morrison, Hamish Stuart, Matt Keegan, go-to-guitar-guy Rex Goh among them – who sound as if they are having as much fun as Mr Percival on the stompers such as ‘I Got A Woman’ or ‘What’d I Say’. But they can equally sound like they are weeping into their beers on the country-Soul gems ‘Your Cheatin’ Heart’ and ‘I Can’t Stop Loving You’. Charles always had great fun (not only with the music but also often too with the sexual politics of the time) with his female backing vocalists, The Raelettes. Vocalists Prinnie Stephens and Mahalia Barnes step up and spar with Percival, most excitingly on ‘Hit The Road, Jack’, recreating Charles’ 1961 sass session with Margie Hendricks. All the hits are here. By the end of the fifteen tracks on A Tribute To Ray Charles the listener has been hipped, flipped, seduced and hallelujahed into a sweet submission. I would perhaps have liked to see a little more play with the arrangements and delivery, but I am sure the decision to not veer too far from the Charles’ originals is all part of the plan. I sincerely hope the plan comes together perfectly for Darren Percival. He – like all hardworking musos – deserves it. Many great works are made in prison. Whether it be a prison of brick walls, a prison of melancholy or a prison of ill-health and pain, the hermetically sealed private world can create a universe of black planets or an efflorescent garden of delights. 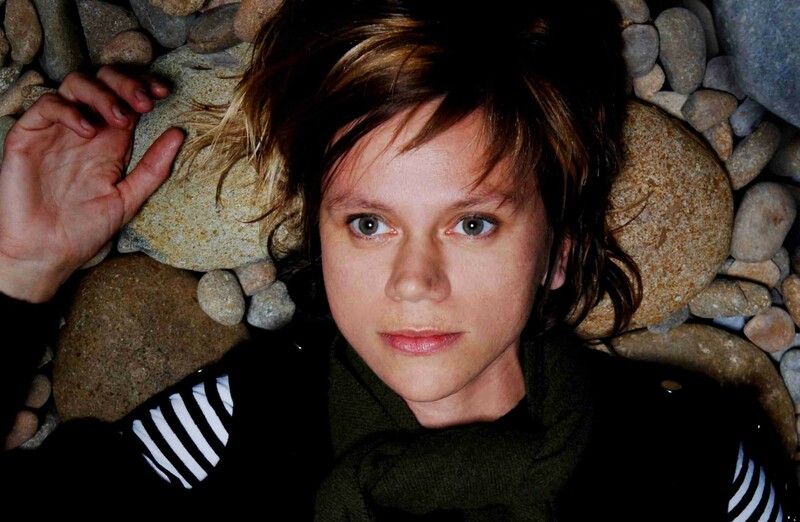 Sydney singer-songwriter Liz Martin spent six months in a room recuperating from painful hip surgery, dealing with her father’s death, lying still. And that room became the garden from which flowered her third album Dance A Little, Live A Little. And what a garden the twelve track collection is – tropical vines grow around blood-red European roses, sunflowers sunnily melt snowdrop edelweiss. Varieties grow all over. Proof that Martin’s spirit is a strong one is in the first tune, ‘So Long’ – a tune that seems to have grown out of a sunny childhood rather than a dismal sick bed. ‘I’ve been trippin’ along’ – it’s infectious and radiant, name checking Jiminy Cricket as it sweetly bounces down its afternoon road. The vibe continues through ‘Be What May’ with its New Orleans slightly tipsy brass. The title track ‘Dance A Little, Live A Little’ is a piece of country rock’n’roll that is part mission-statement, part-call-to-arms. To think it was written and worked up while Martin was forbade to even tap a toe by her surgeons is pretty amazing. Drummer Hamish Stuart and double bassist David Symes set up beautifully the spry groove for Martin’s cover of David Bowie’s ‘Sound & Vision’. The initial vocal lines are sung by guest Mr Percival to great effect – so that when Liz Martin enters the piece goes to a new place. As faithful in verse form as this is to the original, this version is truly Martin’s – a delight of jazz-pop lounge swing. But not all is sun, fun and Low covers. The moodier pieces on Dance A Little, Live A Little are entirely captivating and deeply effecting – one can hear the isolation they were created in. ‘Olives and Wine’ with its lovely uncurling, softly crying viola line is intimacy itself. ‘Night Time’ is ragged shards of raw dead black guitar hung on a black sky. ‘Darling’ is one of those preciously held moments where a singer and a song are all you need for a few minutes. Martin and arranger-producer David Symes have framed each piece perfectly – whether piano and strings, Allen Toussaint swaggerin’ horns or rock guitar trio – each song is given all it needs to live. The musicians who make these arrangements spark and roll are among Australia’s finest – jazz go-to guy Hamish Stuart shines on everything he touches here and Stu Hunter’s piano goes beyond ideas of restraint and colour to organically breathe through its teeth throughout the album. Liz Martin is touring Dance A Little, Live A Little national wide over the May and June with a crack band featuring Dirk Kruithof and Elana Stone. It will be a pleasure to hear these songs that were born is a small, shaded room played in bigger, brighter rooms all across Australia. 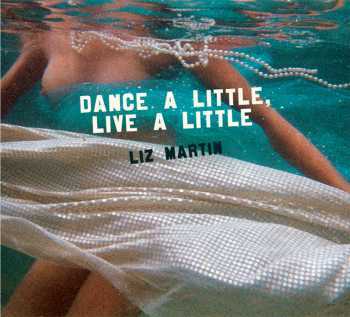 Prior to posting this review, TheOrangePress asked Liz Martin six questions about Dance A Little, Live A Little. Here are her responses. 1. Where did the songs on ‘Dance a Little, Live a Little’ come from? 2. Some of the arrangements are huge – strings, horns etc. Do these arrangements come to mind while writing the song or is it a process conceived later while recording? Some of the ideas came while I was writing and recording in my room. I’d sing little horn lines in, play string parts, bass lines, etc. A lot of the classier arrangements were written by Dave Symes who co-produced the album with me. His solo string line he wrote for ‘Olives and Wine’, the string quartet for ‘Darling’, the crazy horns on ‘Be What May’ and ‘Long Bad Day’, absolutely beautiful. 3. What prompted the cover of David Bowie’s ‘Sound and Vision’? And why did you have Mr Percival sing on it with you? 4. You have some of Australia’s jazz heavy hitters on the album. 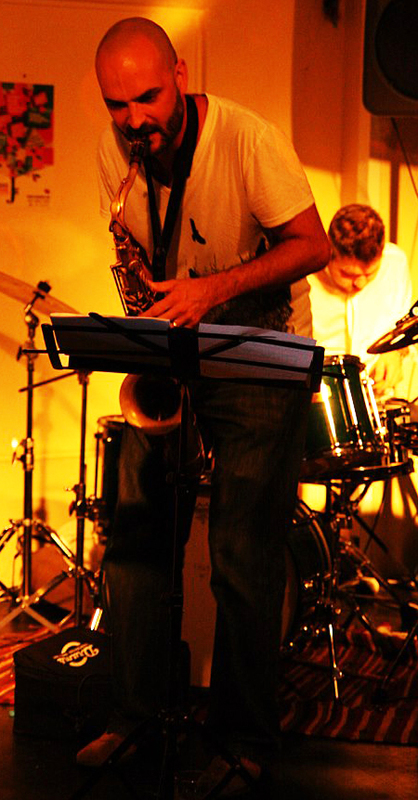 Do you prefer to work with jazz musicians? No, no preference. Although it was startling! These guys are amazing players who have total respect for the music. It’s all about the song, bringing the best to the song. 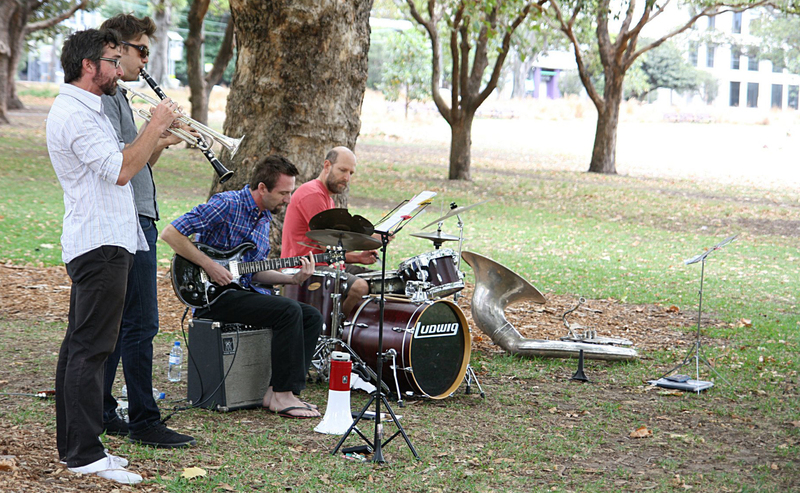 The album is probably half big jazz heavy weights, and the other half some of Sydney’s finest gypsy players like Veren Grigorov and Dirk Kruithof. It was an interesting mix. Basically friends of Dave Symes, and friends of mine, coming together bringing their own elements to the songs, bringing the songs alive. 5. The cover art is particularly striking. What drew you to these Paola Talbert images? I was looking for an image, an idea, something that would match the spirit of the album, the playfulness, the sensuality, the idea of dancing a little, a quiet celebration… And it was Jacqueline Amidy who is touring with us as special guest, releasing her stunning new album ‘Cut’, who suggested the idea. Not everyone could suggest I get into the freezing cold waters of Little Bay with nought by a little tiny shiney material and some pearls. But Jacqueline, whose music is charged, emotional, sensual, rich, of great depth, Jac is just the right sort of person to be able to push, encourage, convince someone of the brilliance of such a plan. And so it was. A brilliant idea. And the result is beautiful. It’s magic. The process was freezing, scary, confusing, fast, confronting and a little exhausting. The end result is dreamy, graceful, titillating (ha), timeless, and free. Perfect for “Dance a Little, Live a Little”, an album written during scary, uncomfortable, lonely times, and the end result, this beautiful, tender, surprisingly playful album. 6. Do you realise how much fun it is to sing ‘Let’s do the Time Warp again!’ to the chorus of the title track? Yes! Nicely spotted. Totally. A complete chordal rip-off. It’s all there. The tight pants, the ridiculous hair. We do what we can to join them. It’s weird… you don’t realise these things at the time… and then a little while later, listening, it’s like,… hang-on… that’s! and yes, it is. An unintended slip back to another time. A time warp all of its own. It is seven years since Sydney guitarist and musical polymath Tim Rollinson has put out a release under The Modern Congress banner. 2005’s The Hidden Soul of Harmony was described as “a smooth seductress that aims (and succeeds) to tease and tantalise lovers of contemporary jazz.” (In The Mix, May 10 2005). Purple prose aside, it really was a delight; an urbane, chilled delight. Rollinson’s tenure as an original member of D.I.G. (Directions In Groove) as well as a sharp and imaginative jazz guitarist (check out his jazz trio sometime) allows for his musical vision to be an eclectic one. 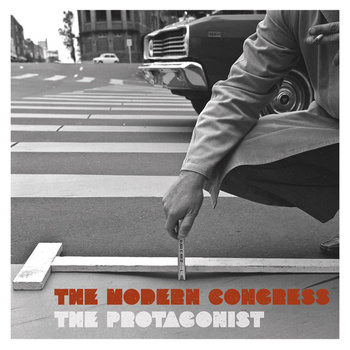 His studio/electronica alter ego The Modern Congress widens that vision even further – limited only by Rollinson’s imagination, a singular imagination both febrile and fertile – for the new one, 2012’s The Protagonist. From the dubby snare shots into the tabla groove of opener ‘Mesquite’, Rollinson pulls out myriad upon myriad of sound, his liquid guitar glistening over the top. ‘The Halo Effect’ is a gorgeous slice of Latin rock with a sly Hammond solo from Darren Heinrich and a wicked Green-powered guitar solo, (Grant, that is – not Bob Brown) from Tim Rollinson himself. ‘Justified’ features the wise yet pained vocal of Linda Janssen over a smoky chill groove. Tina Harrod lends her wonderful talents (singing at the top end of her register to great effect) to ‘Little Man, Big Man’. As you can see, Rollinson has an A-list of collaborators on The Protagonist. 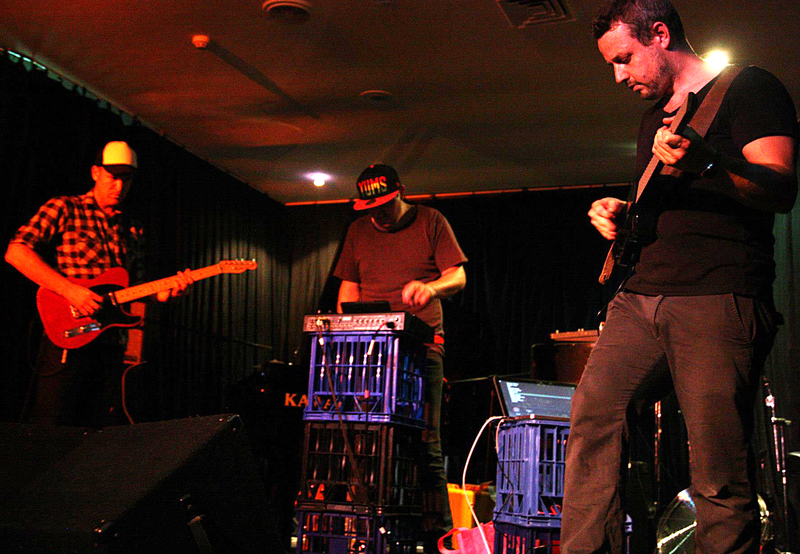 The album bristles with input from international and Australian jazz heavy hitters. Almost all of D.I.G. is here (Alex Hewetson, Scott Saunders, Rick Robertson), as well as go-to guys such as Gerard Masters, Hamish Stuart and Jonathan Zwartz. New York-based Barney McCall lends some dreamlike Wurlie electric piano to ‘Dew’. But this is not a ‘jazz’ album in the sense of head-chorus-head; far from it. As stellar as Rollinson’s contributors/collaborators/partners-in-groove are, they do not impose their will upon the music beyond lending each track just what is needed. In fact, several of the individual musicians recorded their tracks remotely and sent them in to Rollinson. And it is this sense – the sense of Tim Rollinson as The Improviser – weaving music in the studio from all these great players’ individual threads that retains The Protagonist’s ‘jazz’ feel: that feeling of wonderful openness and possibility, even though the tracks were painstakingly put together in a low-lit studio and not a humid stage somewhere. It is testament to Tim Rollinson’s artistry and deft feeling for music that this works at all – let alone as beautifully as it does. A perfect example is The Protagonist’s 2-part closer – ‘Once Upon A Time (Parts I & II)’. A lazy drift of beats and accents, it features Eduardo Santoni’s wordless vocal in Part I and Chris Field’s tabla in Part II. It just goes on and on, like clouds blowing across an afternoon hilltop or a midnight rain streetscene sliding by a cruising car, one idea dovetailing into the next as if Rollinson was sitting at a great keyboard, ‘playing’ his players. Which, in effect, he was. Check out The Modern Congress’s website here.